policy advocacy, and community programs. A healthy, happy life for every animal. ensure that we can reach every shelter, rescue group, and owner in NJ. affordable, and reducing the numbers of homeless animals in local shelters. anesthesia time reduce the pain for our patients and significantly speed up the recovery process. We are proud to be the exclusive administrator the New Jersey component of SPAYUSA’s national program: Spay/NJ. Return (TNR) programs every year. require oversight of their humane feral cat population control programs. to one of our partner shelters in New Hampshire, Vermont, Massachusetts, and Maine. 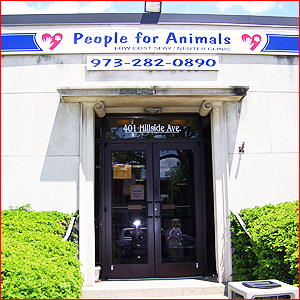 People for Animals is a registered 501 (c) (3) non-profit organization- Federal; Tax ID # 22-2331492.